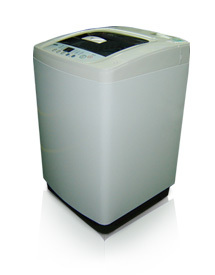 The LG WF-T7070CT is a white top loader that boasts of several features. Among these is the Punch+3 Mini Pulsator and the Turbo Drum. This washing machine also has several other features designed for the efficiency of each wash and convenience of the consumers. The washing machine has a stainless steel tub. This means that it can last longer compared to other units. With this type of tub, you can ensure that rust won't develop easily and ruin the laundry. The washing machine also comes with a good set of wash programs. The top-loading programs include Fuzzy, Wool, Quick Wash, and Jeans. The washing machine has Programs-Dryer, which include Time Delay and Child Lock. The appliance also offers the Soak and Rinse programs. The washing machine has a Lint Filter that prevents the lint buildup in your washing machine. The pulsator of this washing machine is Punch 3+, which guarantee the efficient and thorough cleaning of the laundry. This washing machine has an adjustable leg. This can help you efficiently set the appliance in your laundry area. Aside from that, the adjustable leg gives the washing machine stability. This top loading washing machine comes in white color. The design is very simple. The controls are easy to manage as well. For the Door Lock Indication, there is the Door Inter Lock (Magnetic Sensor) that allows you to close the door smoothly without slamming it. With this washing machine, you don't have to spend money on repairs or buying new ones. This is because the tub is durable because of its stainless steel. The washing machine can ensure that your clothes will come out clean because of the Punch +3 mini pulsator and features that make the washing performance reliable and powerful. With this washing machine, you can close the door efficiently. The door has a magnetic sensor that prevents it from slamming. You can also minimize the lint on this washing machine through its lint filter. Whatever type and amount of load you have, this washing machine has programs that would be suitable for your load. With the washing machine's adjustable legs, you can make the appliance more stable. It allows you to install the appliance efficiently. The color and the design of this washing machine is plain and boring. If you're looking for something that could render sophistication and elegance to your laundry area, this one is not your best choice. Although the color of this machine can go with any type of laundry room, its color and appearance are not really unique. The washing machine lacks other useful specs and features. It does not have a feature that ensures the quiet operation. Aside form that, it is not an Energy-Star qualified washing machine. This means you can't really reduce your monthly utility bills.